For your standard paired comparison test, where the Left & Right sides are presented simultaneously, AND your are only asking Paired Comparison questions. For your standard sequential monadic test, where the Left side is completed and answered, and then Right side is completed and answered, one at a time. Challenge here is that both of the two samples (aka treatments) are being presented at the same time, and responses are being answered simultaneously. This is not a traditional Sequential Monadic presentation test. Two Sample Experimental Design Test, random and balanced placement of Sample 1 on the Left & Right and Sample 2 on the Left & Right. You can inform your panelist on your ballot which Blinding Code goes where as shown below. Display the ballot in Profile mode, where both Left & Right can be answered at the exact same time. 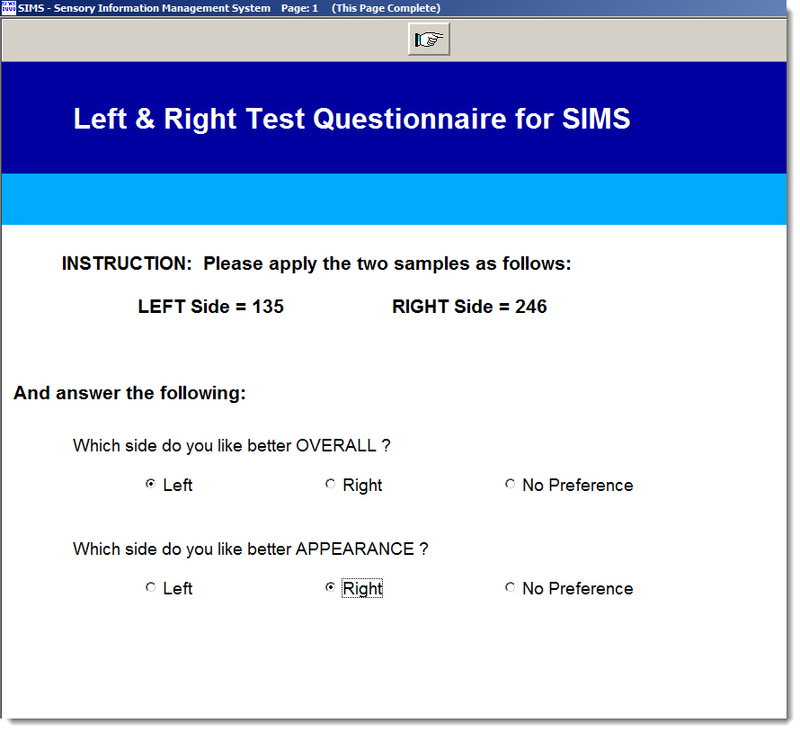 This is the recommended setup for your Left & Right Simultaneously Test. Challenge again here is that both of the two samples (aka treatments) are being presented at the same time, and responses are being answered simultaneously. This is not a traditional Sequential Monadic presentation test. 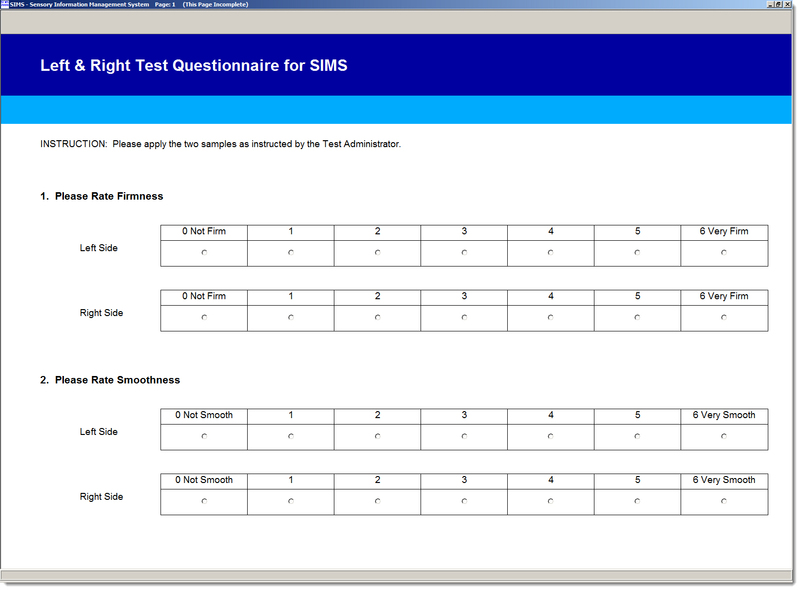 Ballot with both the Left and Right individual questions, where Left & Right represent the two samples. The sample'ing here is handled in the ballot, not the experimentsl design. One Sample Experimental Design Test. For your reporting, since your Left questions are one sample and your Right questions are the other sample. 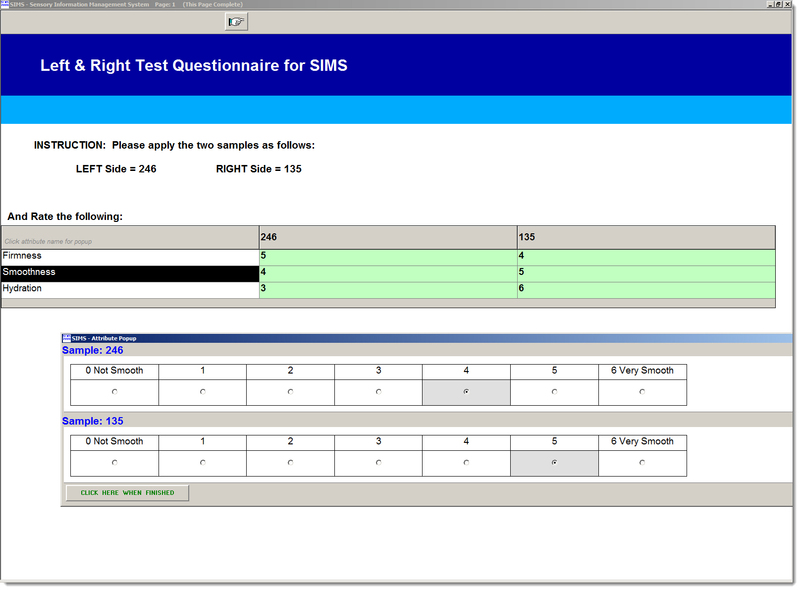 Reporting for this single sample design will be primarily be via Frequency Reports and Raw Data Reports. Random and/or rotated placement for Left and Right samples will need to be managed by the technician delivering the samples. We would recommend that some logic be followed, such as all Odd# ballots get one Left and Right combo, and all Even# ballots get the other Left and Right combo. For your reporting, you'll need to know which panelists got which samples on the Left and the Right. 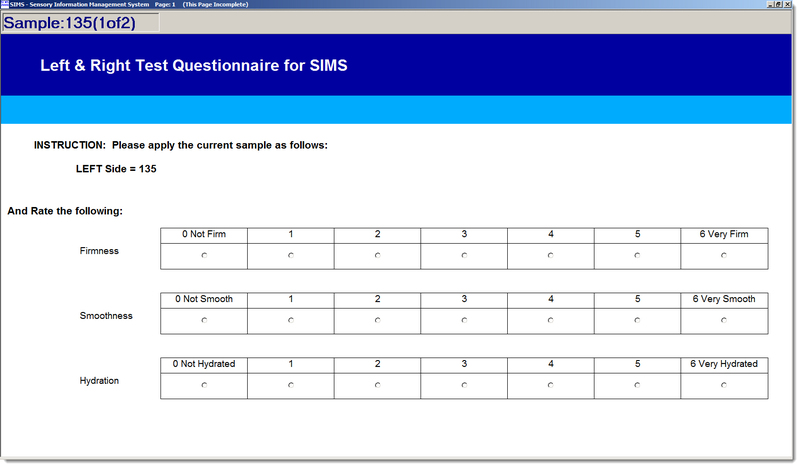 SIMS Test Rotation plan will not be able to tell you this information. Reporting for this single sample design will be primarily via Raw Data Reports. This test setup is not recommended.